Hello, everyone! Welcome to my Castle. I hope you "royally" enjoy the projects I've prepared for your visit. The following projects being displayed here make use of the Greenhouse Garden stamp set and the Tea Party Designer Series Paper. Pictured here are 6 cards with a matching purse. The purse holds all 6 cards plus envelopes. Who doesn't like purses? This set would make a really great gift for Mother's Day or a gift for friends and families. You can't leave my blog without leaving a comment here! Why? Because I'll be giving away this tutorial to 5 people. So leave a comment here on this post and come back on Wednesday and see who the winners are. I'll pick 5 names on Wednesday May 5 at 9 PM Pacific Time. The winners will then need to email me their email address and I'll email them their tutorial. I hope you've enjoyed your visit to my Castle. 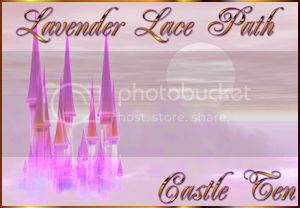 You can board your coach and continue down this Royal Path by clicking on one of the ruby glass slippers below. If you want to return to the RBT website home page for any reason, just click the coach icon at the top right.Otherwise, click one of the red slippers below to go to either the next blog or the previous one. Thanks for visiting my blog. Happy Thursday, everyone! Here is another card using the Elements of Style stamp set. Oooo! I love this set so much! The birds are the Extra Large Two-step Bird punch. I see so many people made flowers with this punch and I'm going to try to make some too. Thank you for visiting today and have a great day! Hello, everyone! Beautiful day today! It is always nice to have a sunny day. I made this card for my nephew's birthday coming in May. He's turning 15. He is growing up so fast and he's taller then me. Thank you for visiting today! Don't forget to join in on the Royal Blog Tour on Friday, April 30. Happy Monday, everyone! 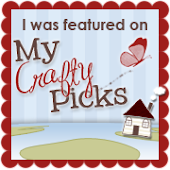 So glad you visit my blog today! Here is a card I made using the Elements of Style stamp set from the Summer Mini. You can start ordering this set May 1st. I stamped the flowers in Close to Cocoa ink and coloured the flowers and leaves with Pretty in Pink and Certainly Celery markers. This gives it a soft look to the flowers and leaves image. I did the tearing on the corner of the Kraft cardstock and at the bottom of the Pink Pirouette cardstock. I'm so happy that Stampin'Up! is bringing back the Pink Pirouette cardstock. I love, love, love this colour. 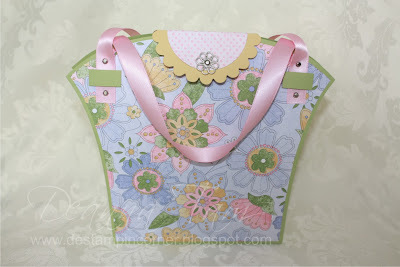 I also sponged around the Kraft and Pink Pirouette cardstock to give it a vintage look. Happy Friday, everyone! Can you believe is Friday already? Time sure fly this week! Here is a card I made to have on hand when I need a card to encourage someone. I always make birthday cards and not much of this kind of cards. Once in awhile people needs an encouragement along the way to keep them going. Now, if only I can write them up and give it to people. That was my goal this year to do that and now it is April and I was only able to give birthday cards. sigh! 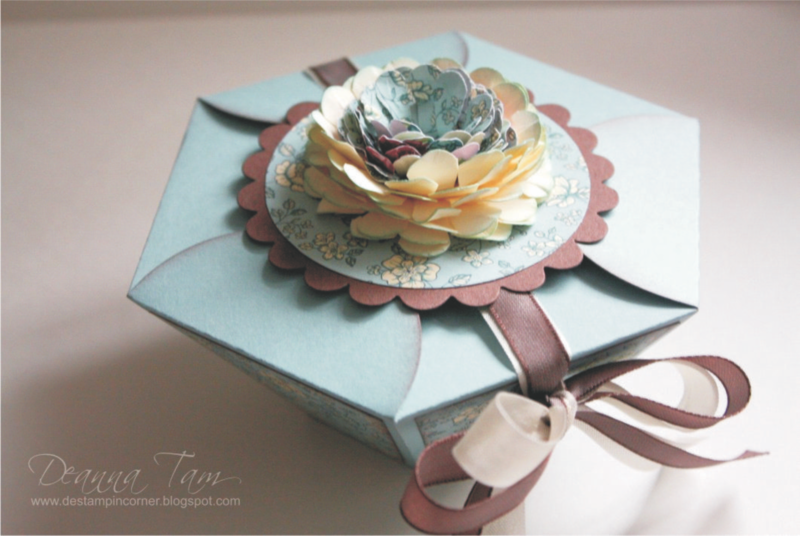 The flower is made from the Circle Scallop Die #2 and I put a circle in the middle. Pierce around it free hand. Happy Thursday, everyone! 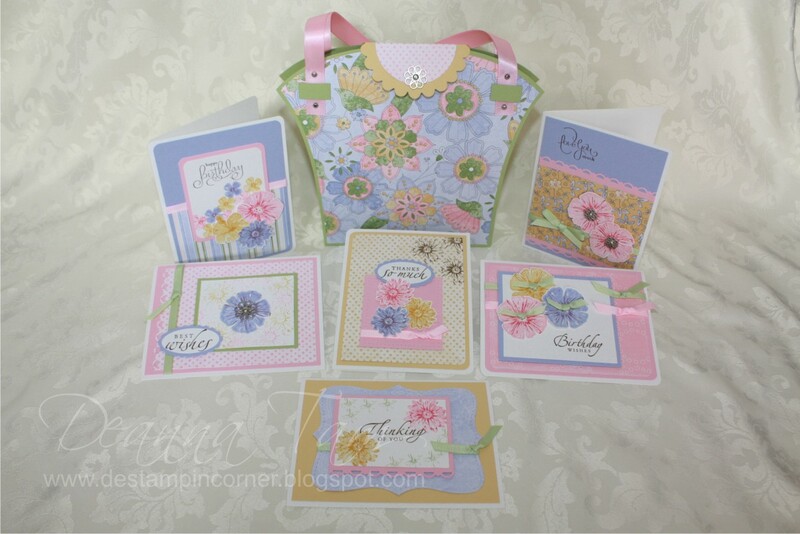 Here is a card that uses the Fifth Avenue Floral stamp set that is on sale at 20% off till the end of April. I use a blender pen to get the shadowy look on the lilies. The stigmas are coloured in with a marker to get the darker look. If you follow my blog for awhile you know that I'm not that good at colouring but I'm trying my best. I like to order the two-step stamping stamp set so I don't have to colour. wink! wink! ETA: I made this card just for fun and Christine pointed out to me that there is a same sketch over at Stampin' Royalty blog. I had no idea! Go check it out if you want to join in the challenge. Thank you for visiting my blog and have a great day! Hi, everyone! Here is a sneak peak of the Elements With Style stamp set from the Summer Mini Catalogue. You'll love this new catalogue! I sure do! The mini is available May1-August 31, 2010. Oooo...such a beautiful set! I love anything swirly with flowers. They make nice background stamp. I add some Dazzling diamonds on the middle flower. You can't see it that well in the picture but it is pretty IRL. Happy Friday, everyone! Aren't you glad it is Friday? I have a day off today from babysitting. Time to make some cards. Here an anniversary card I made for a friend. Another purple one. I have these Vintage Vogue flowers laying around that needed to be put on a card. They were from the Vintage Vogue cards I made two months ago. You can't get the Vintage Vogue stamp set anymore. It was in the Occasion Mini Catalogue. Hopefully it will make it in to the Idea Book & Catalogue. Thank you for visiting today! Have a great day! Hello, everyone! Happy Thursday! I can't wait till Friday! I don't have to babysit this Friday. I'll try to make some cards so I can get posting. My blog has become real quit here. Anyway, here is a card a friend asked me to make for her to give to her daughter's anniversary that is coming up in May. I needed to make it fast so she can take it with her on Friday to the US. Pretty simple ,eh? I like simple sometimes. Too many embellishments on a card makes it look heavy. Happy Wednesday, everyone! Beautiful day here today with sunshine outside! Beautiful flowers are blooming everywhere. My tulips are so pretty this year and the Dogwood tree in front of our house is blooming with flowers already. I love Springtime around here! Here is a card my upline sent me. Isn't it beautiful? I don't have this set yet. Forgot to put it inot my last order. This is a new stamp set Awash With Flowers available for purchase right now. It is a two-step stamping set. There are also 4 other two-step stamp sets that are at a discount. They are Greenhouse Garden, Fifth Avenue Floral, Flower Fancy and Trendy Trees. Click here. Happy Monday, everyone! How was everyone's weekend? I had a good one. We got together with my DH's cousins and made Chinese dumplings. It was yummy. We made the dumplings and ate them afterward. I made a card today! Yay! Not much stamping time for me anymore. I needed to stamp so I took a little bit of time to do it while the baby was sleeping. I don't like how the background turned out though. Doesn't seem to look right. Oh, well at least I made a card. I used the Tweet Talk stamp set for this card. Isn't the little bird cute? He is so chubby and tiny. 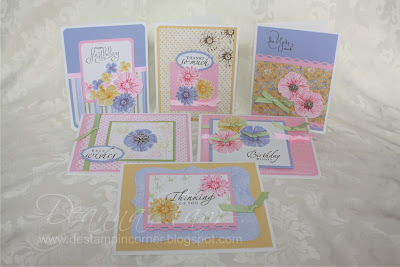 I also made a stack of cards a few months ago using this set and the Sunny Day Simply Scrappin' Kit. You can see the cards on the right hand side bar. Happy Friday, everyone! I'm so glad it is Friday! We have beautiful sunshine today and it feel so good to have such good weather after a couple of gloomy days. I haven't use the Embrace Life stamp set for a long time. Love this set and use it many times. I did the Spot Lighting Technique to the blossom branch. I think that's the term for this technique. First, I stamp the branch onto a Whisper White CS. You can colour the branch or leave it plain. Stamp the branch again on a separate Whisper White CS and then punch it out with a 1-3/8" circle punch where ever you want the spot image to be. You can use whatever size punch you like too. I then colour the punched out circle and adhere it onto the branch. Clear as mud? If not the picture above might help you out. Thank you for stopping by and don't forget the Royal Blog Tour is 3 weeks away! I'm so excited to be in this tour and I hope you'll join me on April 30th-May 3rd. 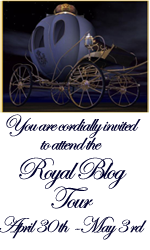 Click on the icon on the top right side bar to visit the Royal Blog Tour blog. Happy Wednesday, everyone! Can't believe it has been a week since I last posted! I was away on a trip to Vegas with my sisters and friends. It was my sister's bachelorette party. I don't know why she'd picked that place. Not a pleasant place to be. Everything was so expensive too. I had fun shopping at the Premium Outlet and being with them though. But I probably will not go back there again. I rather go somewhere else for vacation. Anyway, here is a simple Mother's Day card I made. I use the Vintage Vogue stamp set and did the "Rock n' Roll" technique to the flowers. The sentiment is from the Well Scripted stamp set.